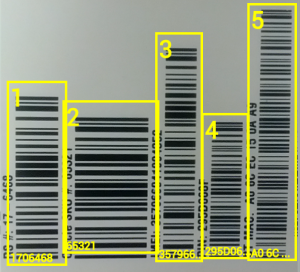 a) If the target barcode is a different type than the surrounding barcodes, then you can select only that format (or formats) to read. You enable this on the Advanced step when creating/editing a service or from the app’s settings. b) With our standard scan engine (not SD PRO yet) the app user can change the decoding window’ size and shape within the camera view. c) You can use a barcode scanning accessory with a pointing light that can be positioned over the target barcode before pulling the scan trigger. d) When creating your ‘Validate Scans’ service type, if you select Pattern Validation then if the wrong barcode is scanned the app user will be shown a red Invalid screen. So, for example, you could make only a certain number of digits be valid and discard the Invalid scans. A great alternative to the standard options is our Barcode Preview technology. Within the camera view of our SD PRO scan engine upgrade, app users can preview the values of multiple barcodes simultaneously and then select the correct barcode to capture and submit to a scan record. This feature can be used in combination with the standard options to make it even more precise. As the camera and auto-focus technology used on smartphones and tablets continue to advance along with codeREADr’s scanning and decoding technology, we see a future where this preview process, augmented with auto-selection technology, could significantly improve the accuracy and efficiency of asset tracking applications. Contact us about your application.